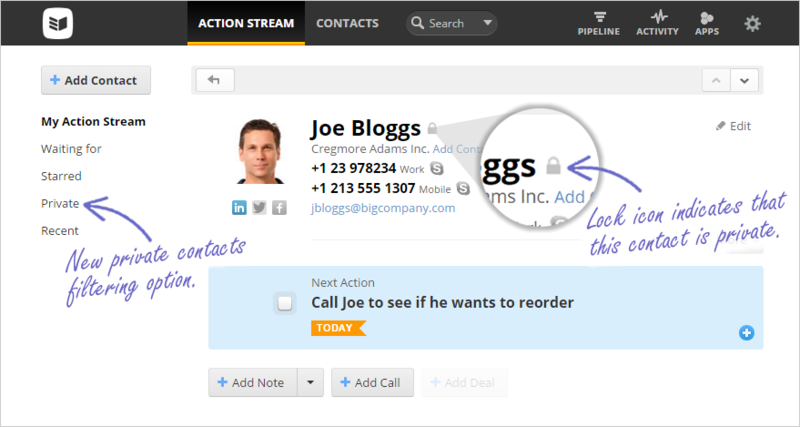 Managing your contacts with OnePageCRM keeps you and your team in the loop with all of your business’s sales activities. While we operate as a shared database, we understand that some users need to keep certain contacts hidden from the team’s shared activity stream. So thanks to continued feedback from you, we’ve just released the new feature: Private contacts. What are Private contacts and how do I use them? With private contacts users can create a separate group of non sales-related contacts that can be managed privately in the CRM. Now you can apply the Next Action method to all your daily interactions, non-sales contacts included! Marking contacts as ‘private’ in your account does exactly that – these contacts are for your eyes only! Any contact who is assigned Private status by you will only appear in your Action Stream and new Private filter. These contacts cannot be accessed by anyone else, including the account owner or administrator. Use Private contacts to separate non sales-related contacts such as legal or financial contacts, from the rest of your sales team. It’s important to remember that the strength of a CRM lies in the shared knowledge that a company has on its contacts. While some sales professionals argue that marking contacts as private is good for ‘protecting’ them from other team members, this is not what Private contacts in OnePageCRM is designed for. Private contacts will not solve the issues of working in a competitive sales team, so we recommend that you only use it for non sales-related contacts. We will be introducing another level of separation for teams in the near future. The account owner and administrator instantly have access to create their own Private contacts in the account. They must enable this privilege in the settings for the rest of the team. 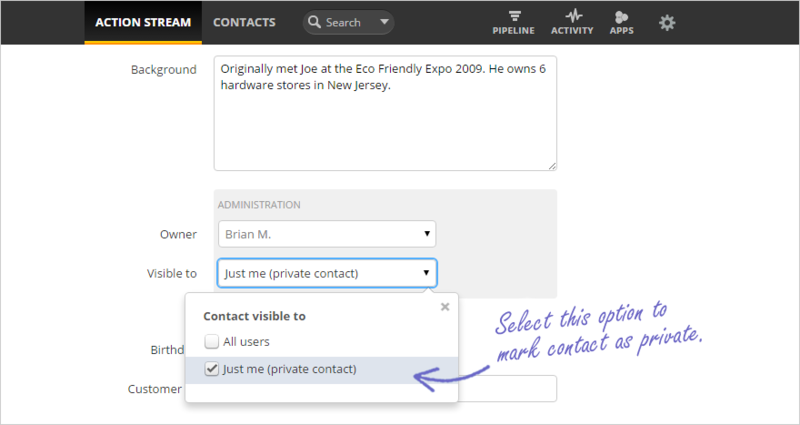 Once enabled, a user can quickly set a contact as private when editing the contact’s details. Simply scroll down to the Administration panel and select Contact visible to Just me from the drop down and hit save. You can recognize a Private contact in your Action Stream by the lock symbol beside their name. Check out our help article for more information on setting up Private contacts. If you have any other questions or feedback, please comment below, or drop me an email to brianm@onepagecrm.com. This is a fantastic function for us to have . Absolutely agree that the strength of CRM lies in the shared knowledge. However when you get used to OnePage nothing else will really substitute in the occasional situation where you need to make a contact private! Thanks for taking user feedback on board. This is great but it still hasn’t fixed the issue with mobile app users not being able to see company wide contacts (i.e. contacts that are owned by someone else). Can you comment with an idea when this will be resolved as it really is a pain. Hi Ben, thanks for commenting. We’ve actually just updated our mobile apps adding Team Stream, Custom Filters and a Global search throughout the app. Check out our blog post on it here for more information. While you are updating your mobile apps can you please do one for Windows Phone OS? The full site is clunky on a 5″ screen. Thanks for the update. How do integrated apps handle private contacts? 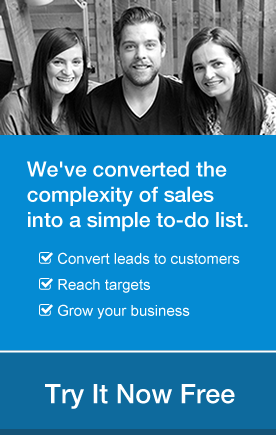 Will these contacts be synced with newsletter lists? It is quite important that private contacts stay hidden no matter what. There is no meaning to keep a contact private in one app and have it displayed in another. An option to choose on such integration would be nice to have. Hi Paris, thanks for your comment. Private Contacts cannot be transferred across to other apps once they’re set to Private, as a result they’re also not visible in mobile to keep them this way. I’d be interested in hearing more about what you mean by ‘an option to choose on such an integration’ if you could email me what you’re thinking: brianm@onepagecrm.com. Thanks, Brian. It would also be useful to mark entire companies (and automatically all of their contacts) as private. Pointless for a company with a Sales Manager, Director of Sales and Sales Reps. We would have loved this if it was that amazing update we are still waiting on. We actually didn’t need “Private” we just needed that drop-down to include Self Only; Manger; Owner or All. This would be great since the managers can see what the reps are working on and the pipeline but other reps can’t. Hi David, thanks for your feedback. Private contacts is actually the first step towards a full Team Configuration option which should answer your requirements as you stated above. This is currently under development and should be released in the near future, I’ve added you to our notifications list for this. 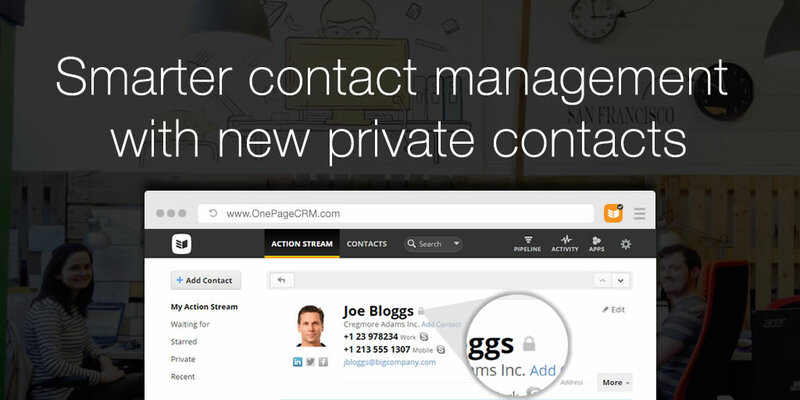 I understand that Private contacts may not be of much use to you as a sales manager but it is a feature which many of our customers have requested as entrepreneurs and smaller sales teams who do actually want to follow up with their non sales-related contacts using OnePageCRM. Thanks for your continued feedback, Brian. Can you please add me to the notification list for this feature, too? Thanks for reaching out – I’ve included you on our list to be notified on release. 1) Android: The private feature is not available in the Android app. I’ve reported it to your coleagues. 2) Piesyng: Following your CEO suggestion, I’m testing piesync in order to have my OnePage contacts also available in Google contacts. However, I’m afraid private contacts do not sync. Is it correct or am I missing somethings. 1) I see that you were speaking with Kevin from our customer success team about the Private contacts in Android. Since it is currently a Beta feature it is still limited in terms of functionality and is not intended to appear in our mobile app at this time. I have taken note and can contact you if we proceed to include it here in future. 2) Unfortunately, as well as the limited nature of the Beta feature, if Private contacts were allowed to sync with other applications, we would not be able to be sure that they are kept private outside of OnePageCRM. As a result, we have no plans right now to make this a part of this feature. I’ve seen the other Q’s and A’s regarding exporting private contacts to other apps, but just wondering what happens to a users private contacts when they leave the company? Do they remain invisible to the administrator when the contacts are being reassigned and then get deleted along with the account? What happens if, instead of deleting the account it’s transferred to another user. Will the new user see the private contacts then?Can they be exported by a user before leaving the company? (even if the export contacts functionality has been disabled by the administrator?) Also if users don’t have permission to delete contacts, does that mean they can or cannot delete their own private contacts? Many thanks. Hi Nick, thanks for reaching out! When a user leaves the company and is removed from OnePageCRM, the account owner or admin will have to check a checkbox agreeing to delete their Private contacts see here. This is to keep these contacts private for this user. It is still possible to transfer all other contacts to other members of your team but just not Private contacts. If a user does not have permission to delete contacts, then this extends to their private contacts also. Let me know if you have any more questions or feedback! Private Contacts are definitely a step in the right direction! But what our company would really benefit from is if a user setting existed that would just hide all financial information from that user. We want everyone to be able to comment on our customer’s profiles, so that all client communications are documented in the same place. But we’d like to keep the actual “deal” numbers from some of our production staff’s eyes, just to make sure that the number on the project doesn’t influence their attitude or work towards the client. Hi Emily, thanks for your feedback! Right now we don’t have plans for this feature. We encourage our users to work together towards bringing their contacts closer to a sale using the Next Action methodology; working on each in the order of their action’s priority rather than the value of the client. We do have an option to limit sub users access to the pipeline page but the deal information for a contact will still be visible when they open contact view. Hi, thanks for your comment. Happy to hear you enjoyed the article.